Talk about procrastination! I started this dress the same time last year, after I finished a sloppy version of Sabine's short corset to wear under it. I got as far as attaching the front of the bodice to the skirt before feeling like it just wasn't working, and not having the prospect of any era-appropriate events in the near future, set it to one side. 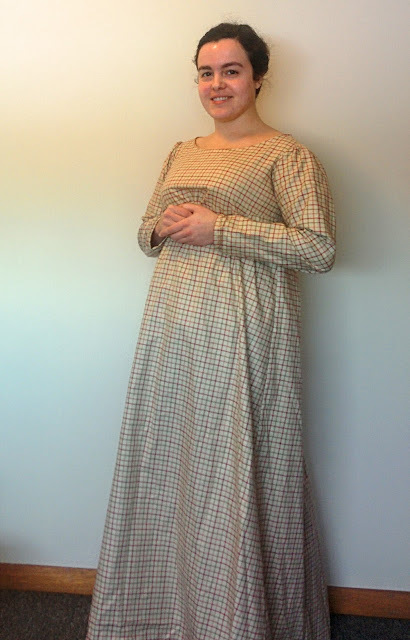 But then Regency Women's Dress came out, and I moved up to the Canadian border, and I was asked to speak about women's clothing at an event this winter, and I needed to finish this. Although it's turned out that I won't be able to do that event, I still needed to finish it! Sometime after moving, I found a wearable mockup long corset I'd made and never gotten around to copying and doing up properly. (NB: I still haven't!) it didn't/doesn't fit quite properly, but the important thing is that it creates the 1810s silhouette, lifting the bust above the natural level. Because of this, I was able to raise the waistline of the dress to the level you see in fashion plates and portraits, which looks impossibly high. There's of course nothing wrong with preferring the lower bustline pre-1810, but using it with a dress designed for the 1810s just doesn't look right. In my original work sessions I scaled up and cut out the pieces and did most of the seaming - the bodice, the sleeves, the skirt - but left all the raw edges. 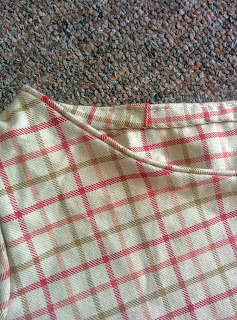 The front bodice piece was topstitched over the sides, and the sides were sewn to the backs with piping (using a narrow string for the cord; too narrow, I think). I didn't do up the back seam of the skirt, but the others were sewn with running stitches. 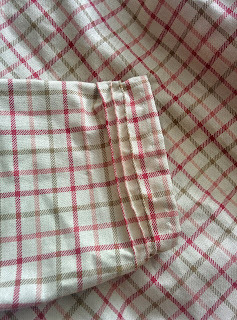 After picking it back up, I sewed up the back, hemmed the bottom of the skirt and sleeves, moved up the waist, and finished the neckline with piping - with a thicker cord, that Sugar 'n' Cream crochet cotton. At first I thought it'd be too thick, but after using it in the Hallowedding dress I knew it was exactly the right diameter. Then I put in large hooks on the right side of the back - one at the neckline and one at the waistline. I saved the pintucks around the wrist for last, so I could just keep making them until the sleeves were the right length. Three seemed to do it. I held off on making thread bars for the hooks (I put in safety pins from the wrong side as temporary bars) because I wanted to make sure it was the right size. WELL. I guess it's a good thing I did, because the dress is too big across the back. It's pinned for the photo, and I clasped my hands like that to hold it in! Unfortunately, my epiphany in scaling up patterns to fit came months after I cut out these pieces, and because my Regency corset is such a pain to put on, I hadn't put the dress itself on in a long time, and even when I did while it was in progress, I didn't have the hooks on and was kind of estimating while pinning behind myself ... It's very tricky to do these things when you live on your own. I recognize this dress from your book! Awesome job on the piping. It makes me want to pipe something. It's pretty fun. 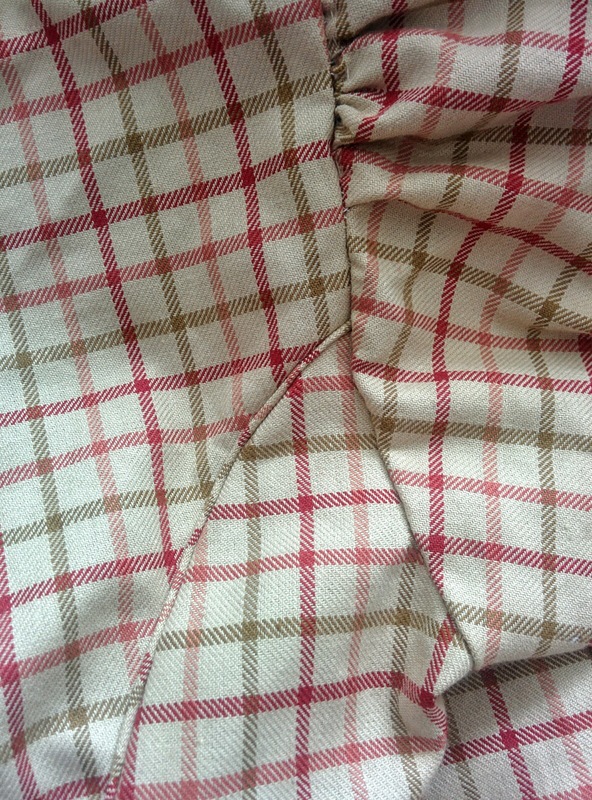 Much better for finishing curves than a hem! I love to see dresses made up closely following original pieces. It looks like a very wearable dress (despite the unforseen challenge it has been to you)...some dresses really are challenging, but I do think it's great altering them and coming up with new ideas! The piping is lovely, especially around the collar. Yes, once I've fixed it it should be a nice, comfortable piece! Thank you. 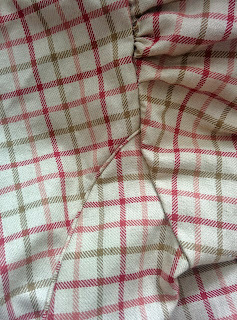 Beautiful details in the handsewing--very nice! Especially the piping--really impressed with your work! Thank you! I've become a big fan of piping, I think everything I make from now on is going to use it.